This article first appeared in Personal Wealth, The Edge Malaysia Weekly, on March 20, 2017 - March 26, 2017. Millennials, who make up the largest segment of the adult population, are coming into their own. Already on the verge of their prime earning years, they will also be inheriting the wealth of previous generations. Many of them are taking the entrepreneurship route, which will fast-track their accumulation of assets. According to Boston Consulting Group’s latest report, Global Wealth 2016: Navigating the New Client Landscape, wealth management firms may lose clients if they do not effectively engage with millennials. The report points out that this segment holds an estimated 10% of global private wealth. As millennials accumulate wealth — at a projected annual growth rate of 16% — they are expected to account for 16% of global private wealth by 2020. “Half the wealth managers we surveyed did not possess a clear view of how to address millennials in terms of service models, products and overall approach. Not surprisingly, roughly 75% of millennial survey respondents who had switched banks say dissatisfaction with customer service was the main reason,” says the report. Millennials are a different breed of investor as they prefer to be in the driver’s seat when it comes to investment decisions. 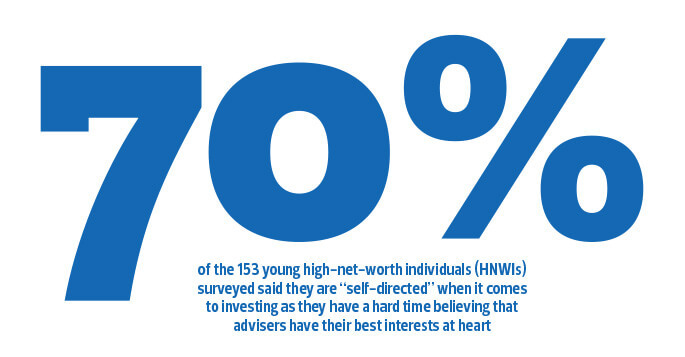 According to Millennials and Money, a report by Merrill Lynch’s Private Banking and Investment Group, 70% of the 153 young high-net-worth individuals (HNWIs) surveyed said they are “self-directed” when it comes to investing as they have a hard time believing that advisers have their best interests at heart. “They seem to be unaware or unconvinced of the industry’s trend towards a model where advisers’ fees are tied to portfolio growth and not how many trades they execute or products they sell,” says the report. Therefore, it is crucial to see what the wealth managers and financial advisers are doing to get them on board. Employing digital and mobile channels aside, more transparency in pricing, assigning millennial advisers to client service teams, improving delivery systems and upgrading the quality of services are some of the things banks and wealth management firms have done to attract customers from this generation. Moreover, the fees that banks charge for products have been reduced over the years. Kaul says this trend will continue as regulators expect the financial ecosystem to become much cheaper. Fees could be half of what they are now by 2030. All these should give millennials some reassurance in trusting financial institutions with their hard-earned wealth, he adds. Dominic Gamble, founder and CEO of Find A Wealth Manager Pte Ltd (Wealth), says more can be done to make advisory fees more transparent. He points out that millennials want transparency and value for money and that many financial advisers have leveraged the opaque wealth management industry for too long and charged clients exorbitant fees. He believes this will come to an end in the next five years. Singapore-based Wealth is a marketplace that matches HNWIs to wealth service providers, including private banks, financial advisers, lawyers and tax advisers. Gamble says if millennials did away with advisers and tried to do it all themselves, instead of paying for professional financial advice, it would be akin to gambling for most people. He thinks millennials should engage the right financial adviser or wealth manager. “Seeking professional advice on wealth is advisable as offerings in the market are increasingly confusing and there is ever more complexity in portfolios as well as personal situations. It is challenging for people to manage their wealth without the help of professionals,” he says. 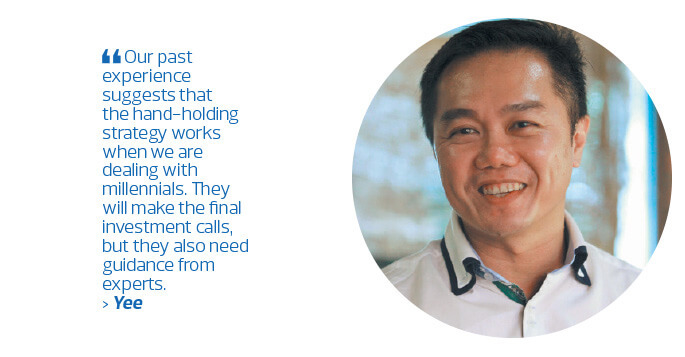 Terry Yee, CEO of Capspring Temasik Financial Group Sdn Bhd, says every client has different expectations about their adviser’s fees and effectiveness. He adds that Capspring has been charging a fair price as it is mindful of what it can and cannot control when it comes to managing its clients’ wealth. Yee notes that millennials in Malaysia are a growing market with huge potential, but financial advisers need to evolve and upgrade themselves to tap this segment. “The tech-savvy millennials are excellent at gathering the information they need from various sources. They question how they can benefit from wealth management firms based on what they have discovered through their research. A good example of this, he says, is UK-based robo-advisory firm Nutmeg. According to its website, the company has got rid of all the aspects that make the wealth management industry unpopular, including high fees, sneaky charges, keeping investors in the dark over where they are invested and how their funds are performing. While Yee believes technology is one of the more effective ways to engage with millennials, he argues that face-to-face conversations that give that personal touch and familiarity to clients will always be needed. That is why financial advisers and wealth managers are still very much relevant in the era of technology. “Our past experience suggests that the hand-holding strategy works when we are dealing with millennials. They will make the final investment calls, but they also need guidance from experts,” he says. Are millennials satisfied with the transformation going on in banks and wealth advisory firms? The Millennials and Money report says they may not yet fully appreciate how wealth management firms have evolved to meet their needs. Advisers must continue to listen to young investors to gain a clear understanding of their concerns and aspirations. It adds that young adults are ready to make wise investment decisions if these firms can help make sure that their natural and healthy scepticism does not expose them to missed opportunities. Kaul says Citibank is trying to do just that — arm millennials with the right information so they can make informed decisions. “Citi is taking the bank to the millennials. As they need digital and social media engagement, the bank is riding on each market’s local digital ecosystem to promote all its offerings to millennials. One of the key transformations is changing the delivery system, says Kaul. The bank needs to allow millennials to apply for a product, complete the documentation and get approval and delivery in the quickest and most convenient way. “Citi is investing a lot in its delivery system to make it instantaneous, real-time and where our clients are. Traditionally, we publish all the output on our website. This used to be a good way to deliver our expertise to clients. However, we have noticed that if we publish the output on social media platforms such as LinkedIn or Facebook where millennials spend a lot of time, the number of views and adoption could well be 10 times higher. In this respect, we are constantly improving our delivery systems,” he says. Kaul believes that a bank that does not want to change its delivery mechanism for millennials will lose out. He thinks banks should leverage their millennial employees to understand the generation better and in return, come out with more strategies to cater for their needs. 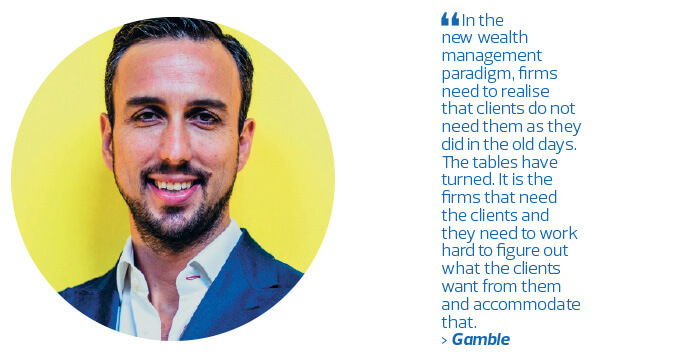 Gamble says wealth management firms are not doing enough to cater for millennials’ needs. That is because there are still not enough convincing push factors for them to introduce radical changes. But this is set to change dramatically over the next decade. Gamble says the market for the mass affluent and HNWIs in Asia will become much larger as wealth is passed down to the next generation. This should augur well for technology-based wealth service providers as their offerings would appeal to millennials. “In the new wealth management paradigm, firms need to realise that clients do not need them as they did in the old days. The tables have turned. It is the firms that need the clients and they need to work hard to figure out what the clients want from them and accommodate that. Millennials are really challenging in this respect,” he says. Under such circumstances, investing in the company’s advisers and managers, such as sending them for value-added courses and programmes, is just as important as investing in its infrastructure, he adds. In terms of product offerings, Citi’s Kaul believes that there are more than enough for millennials to choose from. “I do not think millennials expect anything fancier than what their parents are offered. They do not expect much difference in the offerings. But they do expect the execution of wealth management to be constantly improved,” he says. He thinks the core theme of the intergenerational wealth transfer from Baby Boomers to millennials is wealth preservation rather than taking more risks. The parents can decide how their wealth can be preserved while the millennials can decide what to do with the wealth they generate on their own, he suggests. What else is the bank doing to attract millennial clients? “We are trying to get them into the financial ecosystem at a younger age. We need to demonstrate to them how small decisions at a young age can become meaningful investments by the time you really need the money,” says Kaul.